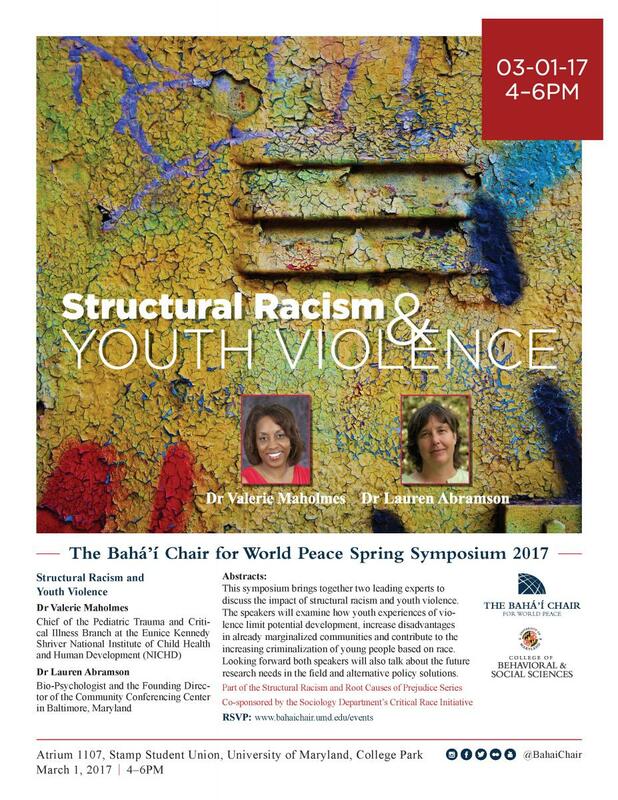 The Bahá’í Chair for World Peace invites you to attend this upcoming symposium on Structural Racism and Youth Violence. This symposium brings together two leading experts to discuss the impact of structural racism and youth violence. The speakers will examine how youth experiences of violence limit potential development, increase disadvantages in already marginalized communities and contribute to the increasing criminalization of young people based on race. Looking forward both speakers will also talk about the future research needs in the field and alternative policy solutions. Event is free and open to the public please rsvp here. Dr. Valerie Maholmes is currently the chief of the Pediatric Trauma and Critical Illness Branch at the Eunice Kennedy Shriver National Institute of Child Health and Human Development (NICHD). Dr. Lauren Abramson is a bio-psychologist and the founding director of the Community Conferencing Center in Baltimore—one of few and longest-standing programs of its kind working in disinvested neighborhoods in urban America. Or click before for more information.